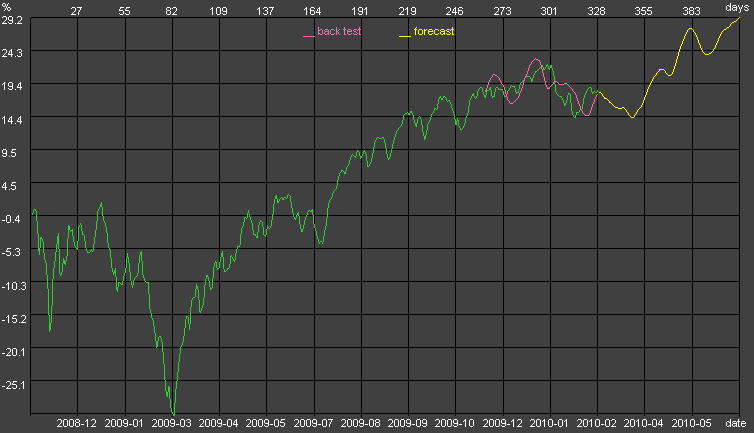 According to cycle analysis forecast, SP-500 performance for March 2010 expected to be negative. The chart below has been plotted using Stock Market Analyzer-Predictor SMAP-3. The stock market performance curve can be considered as a sum of the cyclical functions with different periods and amplitudes. It is not easy to analyze the repetition of typical patterns in stock market performance because cycles mask themselves – sometimes they overlap to form an abnormal extremum or offset to form a flat period. A simple chart analysis has a certain limit in identifying cycles. Addaptron Software has developed Stock Market Analyzer-Predictor (SMAP), computer program, which is able not only to extract basic cycles of the stock market (indexes, sectors, or well-traded shares) but also to predict an optimal timing to buy or sell stocks. SMAP calculation mainly based on extracting basic cyclical functions with different periods, amplitudes, and phases from historical quote curve. To detect correctly major cycles, the historical price data are transformed from time domain to frequency domain (spectrum). Nothing in this piece or on this web site should be construed as investment advice in any way. Always do your own research or/and consult a qualified investment advisor. It is wise to analyze data from multiple sources and draw your own conclusions based on the soundest principles. Be aware of the risks involved in stock investments.